Britain faces further disruption through Tuesday following the most powerful storm to hit Britain in years. Authorities continue to clear away debris and fallen trees while engineers work to restore power to hundreds of thousands of homes and rail services slowly return to normal. A 17-year-old girl was among four people killed as hurricane-force winds battered England and Wales, leaving a trail of destruction. Dubbed St Jude after the patron of lost causes, the storm caused transport disruption on road, rail, air and sea, and power cuts for hundreds of thousands of homes. National Rail said it was not yet able to say how services would be affected on Tuesday but urged travellers to check with their train operator, while ferry services from Dover are still delayed because of rough seas. Up to 166,000 homes across England were still without power over Monday night. The storm, which is now over Scandinavia, will be replaced with far lighter winds and rain in Britain but dozens of areas in southern England remained on flood alert, the environment agency said. Insurers were counting the cost of the storm but said it was too early to tell whether it would compare with the multi-billion pound hits caused by previous severe weather events. Initial estimates of the level of financial damage wrought are not expected until later this week, the Association of British Insurers said. During Monday morning winds of up to 100mph swept through the south-west, south, south-east, the midlands and the east of England after first hitting land in the early hours. Up to 2.4 inches of rain – half the monthly average – fell in a few hours during the storm in areas including Hampshire and Devon, causing flash floods. Bethany Freeman was crushed and killed as a 30ft tree fell on the caravans she and her family were living in while renovation work was taking place at their home at Edenbridge in Kent shortly after 7am. Known as Gia, she was a “universally respected” sixth-form pupil at Tunbridge Wells Grammar School who “had everything to look forward to”, the school’s website said. There were tragic scenes as her driving instructor arrived at her home in Lydens Lane to pick her up without knowing she had died. Father-of-three Donal Drohan, 51, originally from Waterford in Ireland, died after his car was hit by a tree at the bridge over the river Colne in Watford. An officer who attended the scene said that a millisecond’s difference would have made for “a different story”. In Hounslow, west London, three houses were completely destroyed and two more were damaged by an explosion, thought to have been caused by a ruptured gas main. Officers were called to Bath Road at around 7.30am and at noon they found a man’s body at number 47 amid “scenes of devastation”. An hour and a half later a woman – whom investigators were trying to identify – was found dead at the same property. 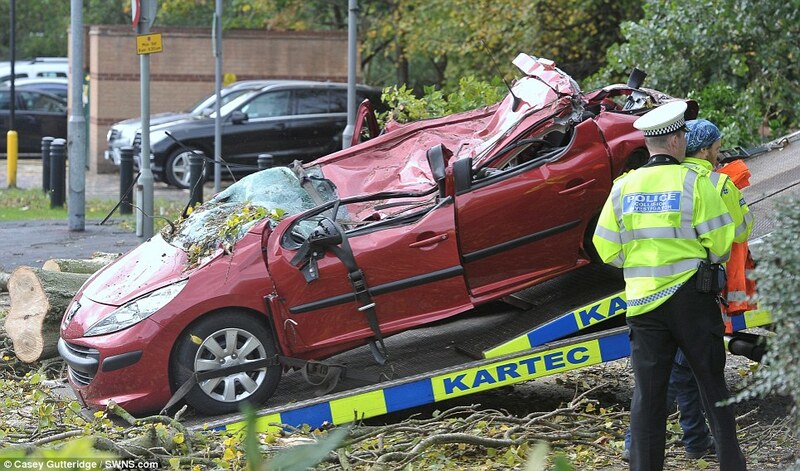 Met Office spokeswoman Laura Young warned the public to remain alert in the storm’s aftermath. John Lee, a forecaster for the MeteoGroup, the weather division of the Press Association, said it was the most powerful storm in years. “There will no doubt be some disruption still following the damage caused by strong winds and heavy rain, but the weather will be quite different,” he said. “It will be blustery with some showers, especially in the west, but a lot lighter. The Energy Networks Association said 459,000 homes suffered power cuts across England, with 166,000 still disconnected. The port of Dover in Kent had to be shut, train and tube services were disrupted, more than 130 flights at Heathrow airport were cancelled and many roads were impassable due to fallen trees. Debris falling on to powerlines caused a nuclear power station in Kent to automatically close down both its reactors, leaving its own diesel generators to provide power for essential safety systems. Experts said the gales were relatively weak compared with the Great Storm of 1987 but the event showed how much weather predictions had improved compared with 26 years ago. Posted on October 29, 2013 by SJ POST. Bookmark the permalink.